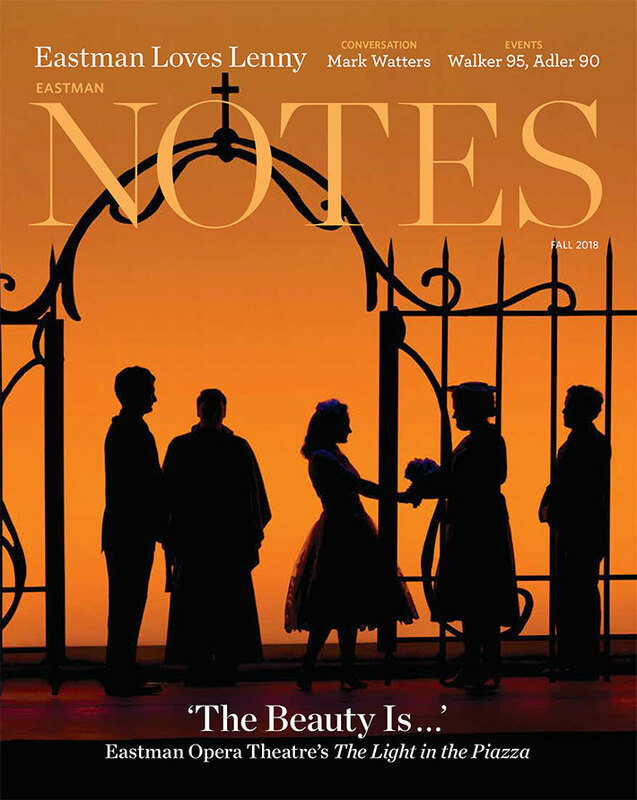 Late this summer, the Eastman Percussion Group played before a large audience at Beijing’s National Centre for Performing Arts. While many of Eastman’s distinguished faculty members have the privilege of traveling internationally to perform at various large-scale festivals and conferences, it is a special professor who brings his current and former students along for the adventure. On August 25, Professor Michael Burritt, Eastman professor of percussion and chair of the Woodwinds, Brass, and Percussion Department, along with several current and former members of the Eastman Percussion Ensemble, performed at the National Centre for Performing Arts in Beijing, in the 2018 Summer Season series. The concert was sold out – 1890 people in attendance, with the experience impacting all who attended, and bringing Eastman, and its impressive Percussion department, to further acclaim in China. 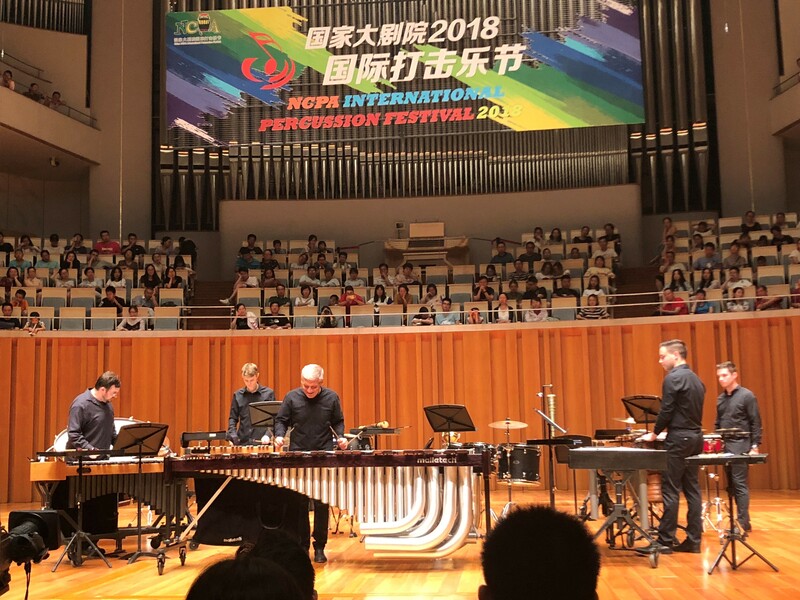 Professor Burritt was invited to perform as a solo artist at this year’s National Centre for the Performing Arts Percussion Festival 2018 (NCPA), considered to be the most prestigious performing festival in China. With several concerts dedicated strictly to percussion, held in two concert halls, Burritt decided to bring a group from Eastman to perform with him, which he called the Eastman Percussion Group. It is a spin-off of the well-known Eastman Percussion Ensemble, a flexible group of current students and alumni set to perform in a professional setting. Current and former students performing with Burritt included Brant Blackard (MM ‘15, current DMA student), Cameron Leach (MM ‘18), Kyle Peters (MM ‘17, current ECMS percussion faculty member), and Connor Stevens (MM ‘15, current DMA student). The Eastman Percussion Group performed several works by Burritt, including: Rounders, “Recitative Cantabile” from Waking Dreams, Sweet Dreams and Time Machines (featuring Burritt and Peters on marimba and dedicated to the memory Burritt’s friend, colleague and former Eastman Dean, Douglas Lowry), and White Pines. Several of these pieces had been performed and premiered at Eastman, but were having their Chinese debuts. Rounding out the program was Bob Becker’s Mudra. In addition to the Eastman Percussion Group, several other great international artists were present: Artistic Director Li Biao, China’s most famous percussionist, a major figure as percussion soloist, teacher, and orchestral conductor; and Colin Currie, a prominent percussionist based in London, performing with his group. Amadinda Percussion Group, from Hungary has also been a past participant, showcasing the level of artists invited to perform by the festival.